Thanx SOD – keep up the good work! As you indicate, you intend to delve further into the physics and physical constraints of precipitation. I think it’s valuable to also consider a distinction between the predictability of temperature versus precipitation. 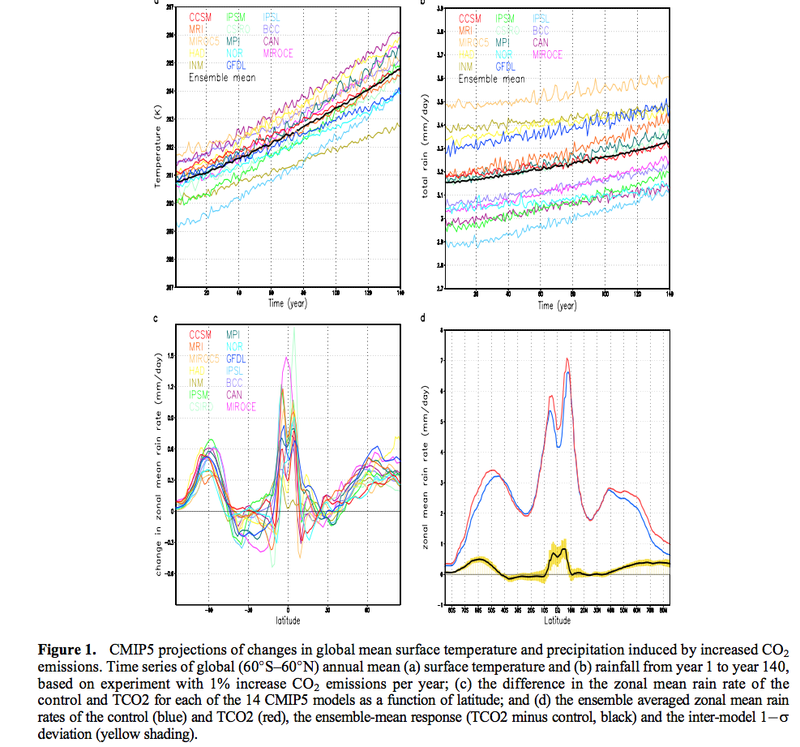 Radiative forcing from increased CO2 in the global mean is quite similar whether the atmosphere is at rest or in motion. Because of this, global mean temperature change, implied by the radiatively forced global energy budget, may well be predictable. In contrast, precipitation is critically dependent on atmospheric motion. An atmosphere at rest has zero precipitation, and so, the effect of increased CO2 on precipitation for an atmosphere at rest is also zero. For atmospheric motions, we know that the specific motions that cause precipitation events are not predictable beyond a week or so. I think we should keep in mind that the predictability of regional precipitation changes may be zero for annual/decadal/centennial time scales. Such forecasts are not validatable for another century. And as indicated by figure S2, some egregious errors exist in hindcasts. 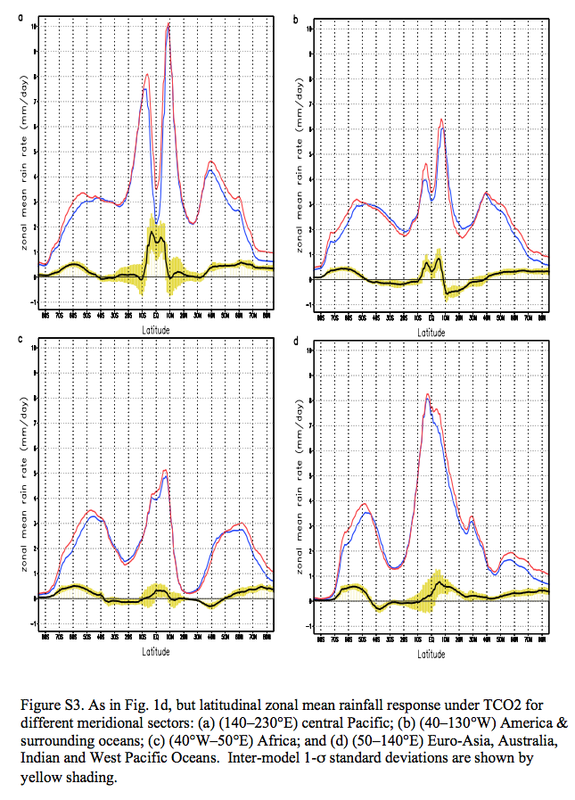 That is also the finding of Zhang,Liu, and Zhang who unfortunately found worse results for CMIP5 compared to CMIP3. Precipitation represents energy transfers, and these transfers alter the very atmospheric motions which cause precipitation. A partially self dependent variable would seem to be fertile ground for unpredictability beyond the infinite array of wave patterns that occur. You can’t have an atmosphere at rest in the real world. The pure radiative lapse rate is way too high. You can’t predict individual precipitation events more than ~10 days in advance. That doesn’t necessarily mean you can’t predict global average precipitation. 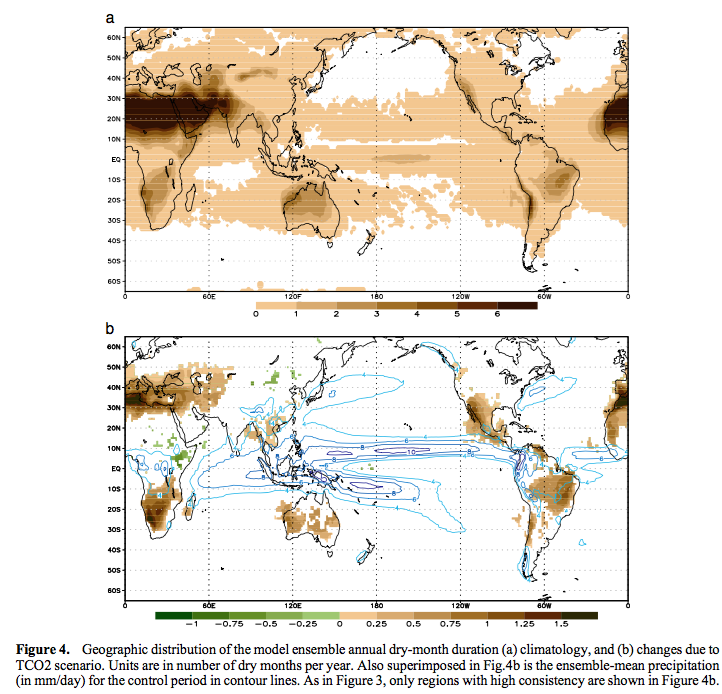 IMO, the current crop of AOGCM’s predict too small an increase of global precipitation with temperature and that’s one of the reasons their predicted climate sensitivity is too high. Although your conclusion may still be correct, I believe your reasoning is flawed. The C-C equation (+7%/K) technically only applies only to water vapor in equilibrium: 100% relative humidity. That is found only within the layer of air adhering to the surface of the ocean, perhaps 1 mm thick. The boundary layer is only about 80% relative humidity, and is less that 100% relative humidity even far from land because drier air from the free atmosphere is being turbulently mixed into the boundary layer. IF this mixing process remains unchanged with warming, then the relative humidity of the boundary layer may rise at 7%/K. In fact, climate models predict that the mixing process will change – that the rate of “overturning” of the atmosphere (or average time between evaporation and precipitation) will slow down. And this may cause a rise in the relative humidity of the boundary layer. I suspect you are headed towards discussing some of this material. However, it makes sense to get things correct from the start: 7%/K only applies to saturation vapor pressure. Constant relative humidity needs to be demonstrated, not postulated. on May 19, 2017 at 2:16 pm | Reply Mike M.
SoD did go on to say “But GCMs and also simple models suggest a lower value, like 2-3% per K, not 7%/K. We will come back to why in another article.” I look forward to that article. I only comment on this since I think Frank likes to get things right and I think there is a mistake here. The reason the RH is less than 100% near the ocean surface is that there must be a net upward flux of water vapor at the surface. That flux provides the water vapor to precipitating clouds over both land and sea. If RH were 100% at the surface, there would be no driving force for evaporation and therefore no net evaporation. Also, the RH must increase with elevation, so there would be a permanent fog. Liquid water would then be falling back toward the surface; the resulting removal of water vapor would lower the RH until net evaporation balances the return of liquid water. If you only consider mass transfer, then at constant RH a 7% increase in saturation vapor pressure would produce a 7% increase in water vapor partial pressure, a 7% increase in the evaporative driving force and a 7% increase in net evaporation. But you also have to consider heat transfer. That constrains the increase in evaporation to less than the increase in vapor pressure and causes the RH to decrease. Mike: I like your explanation. IMO, the expectation that relative humidity will remain constant (+7%/K) is the second biggest over-simplification in climate science (after GHG’s “trapping” heat in the atmosphere). 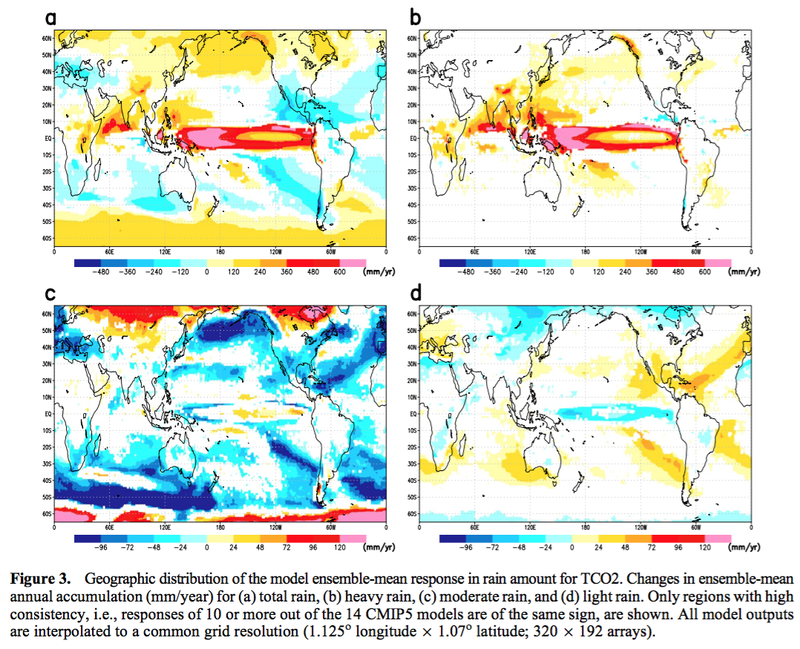 The heat transfer constraint that force precipitation to rise at a lower rate (+2%/K) appears to be essential to the expectation that climate sensitivity is around 3 K or higher – enough though precipitation is not clearly linked to the feedbacks normally associated with high climate sensitivity. This isn’t quite true — air can be oversaturated with water, as without sufficient nuclei or time to condense out, a rising parcel of air at 100% RH can go over 100% (and will, as at 100% humidity there’s no driving force for condensation). So, if the air was 100% RH at the ocean surface, it doesn’t imply that there would be a fog directly above it. That’s dependent upon the rates of nucleation and condensation and their function of oversaturation, plus the rate of convection. on May 19, 2017 at 5:26 pm Mike M.
True. But it hardly matters. With 100% RH at the surface, there would be 101% RH at about 15 m. That is more than enough for rapid cloud condensation. This is an interesting graphic that reminds us of the dynamics. Relative humidity is lower in the winter hemisphere and higher in the summer hemisphere (I’m assuming these are surface). This is because of the much greater generation of cold, dry air masses during winter. These masses spread equatorward, taking up humidity as they traverse the oceans ( though at a rate that leaves them still relatively more arid than during summer ). Peixoto and Oort indicate that evaporation is actually greater in the winter hemisphere and lower in the summer hemisphere ( drier air, windier conditions ). At the same time, precipitation is greater for the summer hemisphere than the winter hemisphere, though dominated by the tropics. This implies cross equator transport of water vapor. 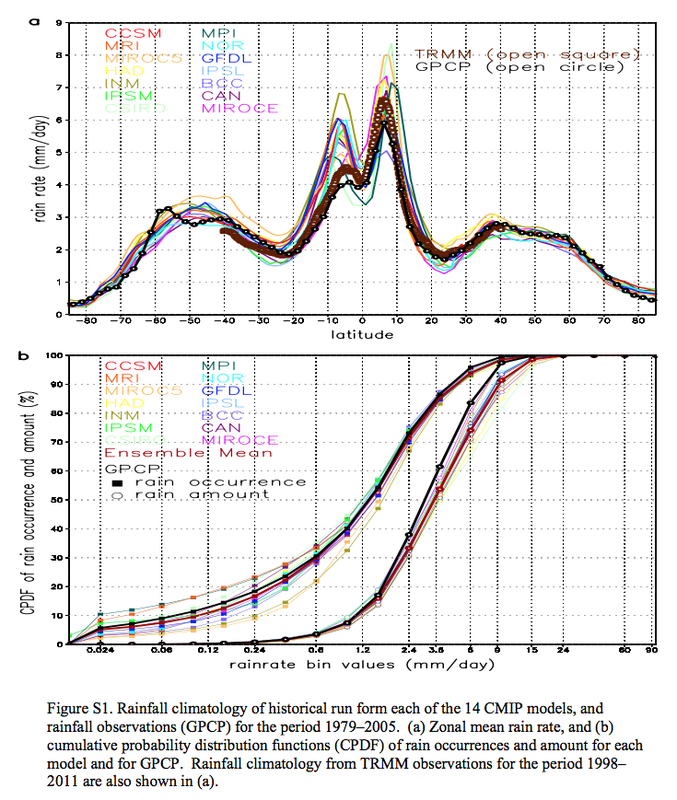 There seems to be some systematic bias on rainfall in models. Does it mean that they assume that it is more water vapor pr degree increase than it actually is? And how does such systematic bias get feedbacks and sensitivity wrong? on May 19, 2017 at 1:56 pm | Reply Mike M.
I am very suspicious of the “wet get wetter and the dry get drier” mantra. During the Holocene climate optimum, when things were warmer than now, most areas that are now deserts were savanna. And during the ice ages, when temperatures were lower, deserts were much more extensive than now. I have seen the claim that both the mantra and the claim of greater extremes are artifacts of something unphysical in the models. The idea behind those things seems to be that if you have an area where water vapor is condensing and more water vapor is flowing into that area, then you get more condensation in those areas. What is left out is that the extra latent heat release results in an increased flow divergence that, in turn, leads to distributing the precipitation over a wider area. Mike: I asked earlier whether our host intended to discuss the “mantra” that the “wet get wetter and the dry get drier”. SOD replied: “I do plan to. One of the commonly cited papers for this is Robust Responses of the Hydrological Cycle to Global Warming, Held and Soden, Journal of Climate (2006). Unfortunately (for skeptics), the arguments are mathematical and appear to rise above “mantra”. I’ve been waiting to see if a post from SOD and comments can shorten my learning curve on this subject. Unfortunately (for skeptics), the arguments are mathematical and appear to rise above “mantra”. The authors take it even further. Not only do “wet get wetter and the dry get drier”, but also “the-middle-class-also-getting-poorer”. As SoD alluded to, this is spread as a marketing tool which makes me suspicious. But, these are not validated models, after all. As I alluded to above, radiative models alone indicate varying levels of temperature increase for nearly all areas of earth. 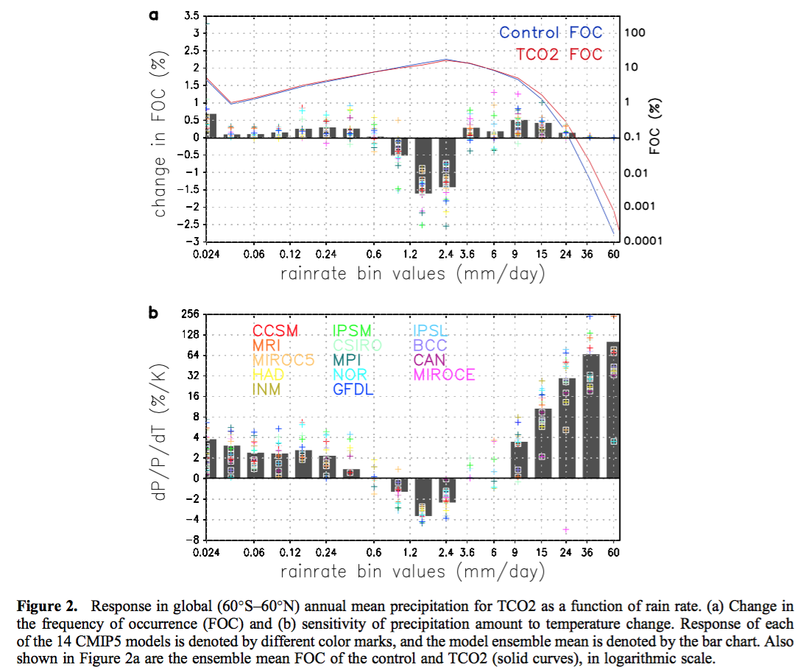 Precipitation, particularly regional variation of precipitation, in great contrast, requires accurate prediction of atmospheric motion from the general circulation models. Such models are chaotic and this periodicities of this chaos include centennial scales. That doesn’t mean nothing is predictable. Many forcing agents of climate and even the general circulation remain relatively constant ( and so, predictable ). That includes the rotation of earth, earth’s orbit around the energetic sun, the presence of oceans and mountains, and of course, gravity. Earth’s orbit will continue to create pole-to-equator thermal gradients, which means we’re confident that a jet stream will exist similar to today’s. The polar thermal deficit and equatorial thermal surplus implies an exchange of mass between the poles and tropics, which coupled with a warming driven increase in humidity, also implies an increase in polar precipitation, as the GCMs seem to indicate. on May 19, 2017 at 5:51 pm Mike M.
If you are referring to Soden and Held, as cited by Frank, you just made that up. I think that is meant in general, not in all cases. And “dry regions get drier” refers to the difference between precipitation and evaporation, not the change in precipitation alone. “the-middle-class-also-getting-poorer” is a direct quote from the Lau et. al. paper under discussion. Turbulent Eddie: My statement that mathematical arguments support the conclusion that he “the wet get wetter and the dry get drier” is based in part on equation 6 from Held and Soden (2006) linked above. This equation – whose derivation and limitations I would like to understand better – is based on physical principles. It also agrees with the results of GCM’s. Like you, I wonder how much faith should be placed in where AOGCMs predict increasing precipitation will and won’t fall. P = precipitation, E = evaporation, a = 7%/K from the CC equation. More importantly, changes in the hydrological cycle are as important to high climate sensitivity as are WV+LR and cloud feedbacks. 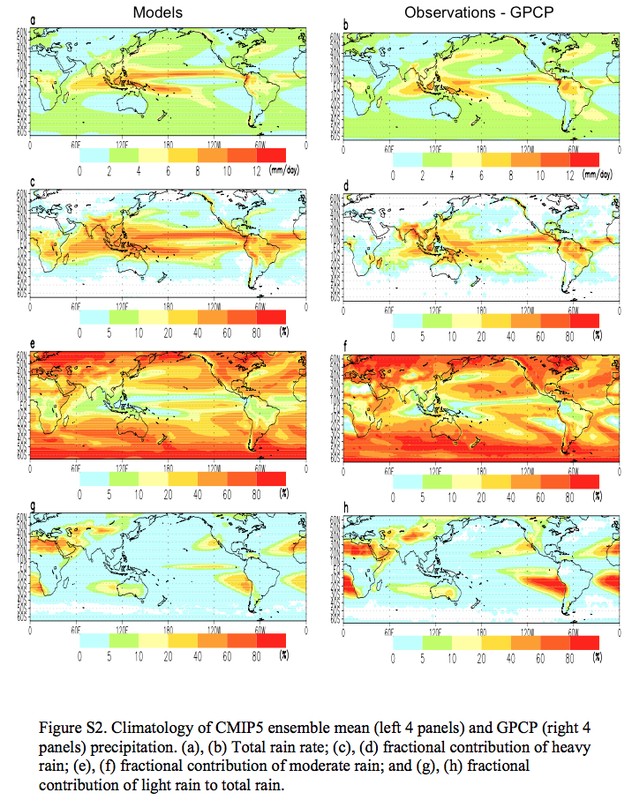 However, these changes in the hydrological cycle are usually presented as an independent prediction of climate models rather than a mathematical consequence of high climate sensitivity. Lau et. al. indicate changes in precipitation, whilst Held and Soden’s eq. 6 is about the differential of precipitation and evaporation. Is this the original source of the mantra? It seems to me that the relationship is being misapplied. Held and Soden were considering hemispheric, meridional transport to explain high latitude precipitation changes. This relationship would not seem to apply on other scales. The approximation in (5) can potentially predict the unphysical result that P ⫺ E ⬍ 0 over land; the modified version (6) has the accidental advantage in this regard that it predicts that P ⫺ E will simply remain small where it is already small. on May 22, 2017 at 1:51 am Mike M.
I think the math mostly obscures the assumptions. Held & Soden write: “A seemingly simplistic but useful starting point for discussion is the assumption that the response of F is everywhere dominated by the change in lower- tropospheric mixing ratios rather than changes in the flow field”. Of course, changes in latent heat transfer must produce changes in flow field, so although it is clear the assumption is simplistic, it is far from clear that it is useful. Then what they end up with is that evaporation, E, should be proportional to temperature change (for small changes) and, on average, precipitation, P, should be proportional to temperature change, so the difference, P-E, should be proportional to T change. But that refers to averages, so it really says nothing about specific areas. In particular, they later admit that the assumption is likely to fail for arid and semi-arid areas. So “wet areas get wetter” is plausible. That seems likely since an increased hydrological cycle seems to be a result that really is pretty sound. So that almost surely means more rain, on average, in places that get a lot of rain. But with a lot of variation from one area to another. Also, more latent heat release implies more flow divergence and rainfall spread out over larger areas. But “dry areas get drier” is the much bigger concern since that implies desertification and increased water stress in areas that are already stressed. There seems to be little basis for that part of the claim. First, the assumption used is likely to break down. Second, what I just said about flow divergence. Third, the important thing is not the difference, P-E, but the ratio, P/E (P/E < 0.5 is arid, 0.5 < P/E < 1.0 is semi-arid). If we assume the simplistic theory to be true, then P/E would not depend on temperature. Remember that the theory says that precipitation increases, even in dry areas. Finally, there is the established record of what has happened with past temperature change. Oh, and a bonus: increased CO2 lets plants reduce water loss due to evapo-transpiration, which can be a significant contribution to net evaporation over land. That the mantra gets repeated so much, even by scientists, would seem to be evidence for people uncritically accepting that which they want to believe. My claim was that it is a marketing mantra that catchy slogans spread easily. I didn’t claim that “the wet get wetter and the dry get drier” is a climate science mantra. That could imply some devaluation of the physics reasoning that went into the idea. We should be suspicious of mantras, even though this marketing one is definitely true. We should question physics. The strength of the hypothesis is independent of the catchiness of the saying adopted. In the last decade, more evidence is accumulating that the observed trend has been deviating from a moist adiabat. I think the words in bold represent an extrapolation of the results. Especially, floods depend on important local/regional factors that cannot be determined from CMIP5 numbers.